The below is excerpted from the introduction; download the full statement. As the country increasingly focuses on the relationship between higher education and our nation’s future, the responsibilities associated with effective board governance take on renewed emphasis. Serving as a board member has never been easy. Yet with calls at both the federal and state level for more transparency, improved educational quality, accountability, increased student access and attainment, and cost containment, the responsibilities of boards are more complex and challenging than ever. During the past decade, intrusions into the work of governing bodies have grown significantly. Governors and legislators have attempted to direct governance actions, regulators have tried to redefine board independence, state laws have increasingly encroached upon independent decision making, donors and sponsors have sought to determine institution policy, and a broadening array of organizations has continually worked to influence board decision making. As the overseers of a public trust, boards have an obligation to remain open to external input and ensure the institutions they govern are responsive to societal needs. They have the responsibility to link the colleges, universities, and systems they serve to the interests of the public. Through this special responsibility, boards help their institutions and systems meet public expectations and ensure a high degree of trust. However, boards must also recognize that, in the end, their decision making must rise above the external pressures being applied to their work. America’s unique higher education governance model is dependent on boards consisting of independent men and women acting together to be fully informed and impartial in their policy determinations, and committed to the long-term well-being of the institutions they serve. This statement, first issued by AGB’s board of directors in 2001, has been updated to address increasing efforts to affect board independence from outside the boardrooms of our institutions. It also serves as a reminder to the nation’s 50,000 board members that theirs is a sacred trust that requires awareness, engagement, and independence. Although boards should respect, encourage, and welcome the input of all stakeholders in considering a policy, they must ensure that their decision making processes are free of any undue pressures from external stakeholders—from policy makers (including appointing authorities and regulators), donors, alumni and boosters, corporate sponsors, or political-interest groups/organizations. Boards have ultimate responsibility to sustain higher education’s inherent values—academic freedom, institutional autonomy, and selfregulation—and protect them from those who attempt to leverage influence to affect institutional policy. Board independence is a basic requisite in meeting the fiduciary standards of obedience and loyalty that define a board’s legal obligations. Boards must use the mission of their institution or system as the focal point for their policy decisions, and public institution boards should also be especially mindful of statewide policy agendas as a framework for their actions. Individual board members whose views are not consistent with board decisions must respect the actions of the corporate body and avoid putting their own interests before that of the institution. Boards must police themselves in assuring the highest level of ethical behavior among their members, including avoiding any board member assuming the role as an advocate for a special interest in the outcome of a board’s decision. ensuring that institutional policies governing corporate-sponsored research and partnerships with the private sector are clear, up-to-date, and periodically reviewed. basing the selection or appointment of board members on merit and their ability to fulfill the responsibilities of the position. Keep academic freedom central and be the standard bearer for the due-process protection of faculty, staff, and students. 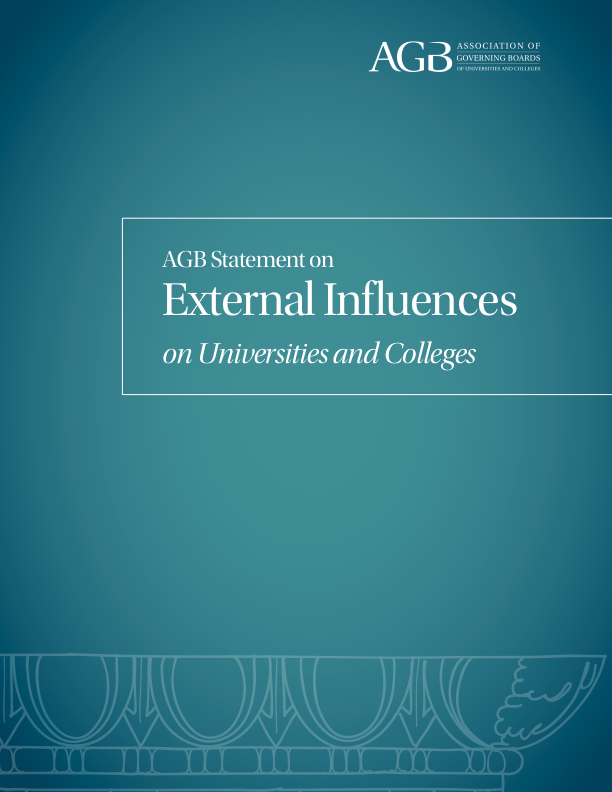 Primarily intended for boards and their individual members, the statement’s secondary audience is the several stakeholders external to the university. Their input into board decision making is often essential and should always be respected, but it should never be unwarranted or intrusive.